From 2nd January 2012: It seemed to me to be an appropriate 1st story, (just updated 24 Dec 2012) being part English, French and Irish myself. Long ago, an Irish fisherman named Robert Joyce left his hometown of Galway, Ireland for distant ports. He sailed on a ship bound for the West Indies, but pirates came aboard and took over the vessel. They kidnapped Joyce, and sold him into slavery. He was taken to a goldsmith’s shop, and forced to work there, worlds away from the woman he loved. Joyce never forgot the Irish woman who owned his heart, and he created the first Claddagh ring as a romantic symbol of their love. His loyalty and commitment to her were illustrated by the charming motifs he chose for the legendary Claddagh ring. Two tiny hands, gently clasping a crowned heart, were wrought from pure gold, and they symbolized the sacred nature of romantic love and faithfulness. Joyce dreamed of returning to Galway and embracing his love, but instead, he languished for years, honing his skills as the Moorish goldsmith’s assistant. When King William III ordered the release of all slaves in 1689, he gained his freedom at last. Despite the pleas of his master, who offered him all manner of worldly goods, and even his own daughter as a bride, if only Joyce would stay on and work for him, Joyce was resolute. He would return to his own true love, and make a life with her. Upon his return, Bruce’s loyalty was rewarded. Margaret, the woman he loved so much, was there waiting for him, just as he had waited for her. And the couple lived out their life together. She wore her Claddagh ring until the end of her days. Claddagh Rings are still a vital expression of romance and commitment. Throughout modern history, the spirit of the first Claddagh ring has inspired politicians, musicians, and actors to choose their own rings. For example, former American president John F. Kennedy was often photographed wearing a Claddagh Ring that honored his Irish heritage. As well, Irish singer Bono, of U2, has worn a Claddagh Ring. The popular television program, Buffy The Vampire Slayer, featured a special storyline that showcased a Claddagh Ring. Since this storyline aired, many Americans have purchased their own rings, captivated by the hidden meanings in the whimsical design. In fact, Buffy The Vampire Slayer is credited with creating a resurgence of interest in the Claddagh ring , by a newer, younger generation. Jim Morrison, lead singer of seminal 1960’s rock band, The Doors, chose to marry Patricia Kenneally, a devotee of Wicca, in a traditional Celtic hand fasting ceremony. When the two were married, they both chose Claddagh rings as their wedding rings. Kenneally is a journalist and author of Irish origin. Her interest in Celtic mythology and Wiccan lore probably prompted the choice of traditional Claddagh rings for their ceremony. Even royalty were known to enjoy wearing Claddagh Rings. Queen Victoria has her own, handcrafted ring, and she wore it often. King Edward VII was also a fan of the classic design. Right Hand, Crown Facing Away From You – Wearing your ring this way will show the world that you are looking for friendship. It will convey availability and interest in finding romantic love. Left Hand, Crown Facing Towards You – If you are married, wearing your Claddagh ring with the crown facing towards you, on your left, hand, will show the world that you are in a permanent relationship. It will serve as a visual clue that you are married and unavailable. 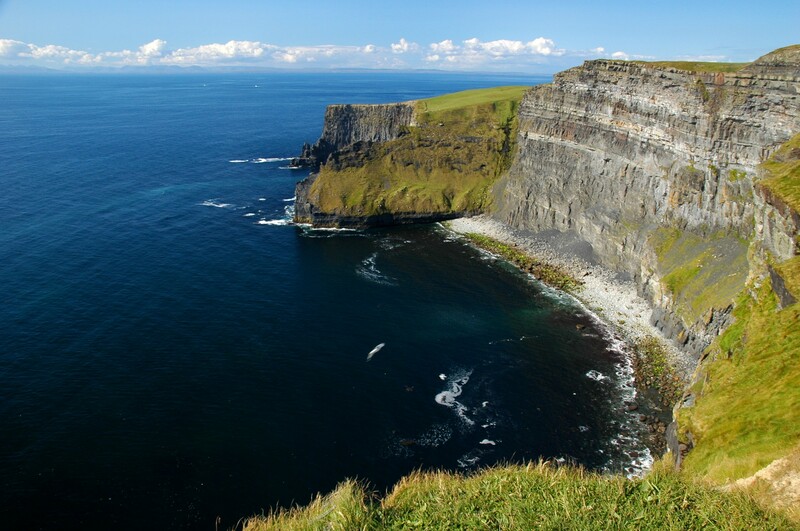 Cliffs of Moher, Ireland, Highest Cliffs in Europe. The area known as The Claddagh is found close to Galway City in Ireland. Hundreds of years ago, The Claddagh was a traditional fishing village, and it sits close to the Spanish Arch, where the townspeople and fishermen gathered to trade and barter. Since the 5th century, the Claddagh was a meeting place for fishermen and merchants, where the river Corrib joined with Galway Bay. Nowadays, The Claddagh has evolved into a coveted residential area, in the city center of Galway itself. It is also the spiritual home of the Claddagh story. The Claddagh symbol has become one of Ireland’s signature motifs. You can find the Claddagh symbol on different types of Celtic and High Crosses, traditional rings, pendants, and earrings, and in paintings, illustrations, and other artwork. Claddagh symbols are a popular choice for Irish candles, decorative wall hangings with samples of Irish verse, and other handcrafted items. At Irish festivals, you will find the Claddagh symbol alongside other common symbols of Irish pride, such as the Harp, the Shamrock, and the Celtic Cross. You may even encounter T-shirts with silk-screened Claddagh symbols. Books on Irish lore and history will often feature the romantic Claddagh tale, with ornate examples of the symbol. In Galway, Ireland, you will encounter many fine examples of the Claddagh symbol, since Galway is the hometown of Robert Joyce, the goldsmith who created the very first Claddagh Ring. You may find that there are several different spellings of the word Claddagh on the Internet and even in books. Some common misspellings of the word Claddagh are “Claddaugh” and “Claddah”. Only the correct spelling, “Claddagh”, should be used to describe the symbols of crowned heart and tiny hands. The Great Potato Famine created an influx of immigrants, who sailed from Ireland to the United States of America. When they arrived, they brought the Claddagh legend along with them. Today’s Irish-American families often pass down Claddagh rings from mother to daughter, as family treasures. For this reason, many people today purchase Claddagh rings that will become heirlooms, just like the Claddagh Rings of old. Some Irish-Americans pass down their own Claddagh rings to their children when they choose to marry. Often, the Claddagh ring is worn as a wedding band. A man or a woman can wear the Claddagh ring, and even children have smaller versions of the classic design. Today’s Irish jewelry designers have added new style to the Claddagh ring. The have also borrowed the symbols of the Claddagh to create earrings, pendants, and bracelets. For centuries, Celtic artisans have been world-renowned for their mastery in metalwork. One of the most famous examples of stunning Celtic metalwork is the ancient Ardagh Chalice, a gold and silver cup encrusted with gemstones and Celtic symbols. Today’s designers honor the past by spending years learning how to engrave the Celtic symbols and markings that can be traced back as far as the sixth century. Often, the classical spirals, knot work, and other common symbols of Celtic mythology are combined with more modern Claddagh symbols, to create works of haunting beauty. The traditional Claddagh Ring is often used as a wedding ring, for both men and women, in Irish wedding ceremonies. 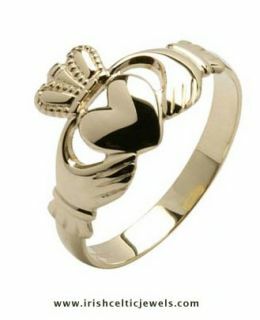 The romantic symbols of the Claddagh are uniquely appropriate as an expression of everlasting love and commitment. In Ireland, Claddagh wedding rings and Claddagh engagement rings are passed down from generation to generation, often on the wedding day itself. The bride and groom wear their rings on the fourth finger of the left hand, with the crowns facing inwards, to symbolize their devotion to one another. This charming Irish tradition can also be followed by choosing new Claddagh wedding rings, if no “family” rings exist. Many Irish-Americans enjoy adopting the traditions of their ancestors by selecting Claddagh rings to exchange on the day of their wedding. There are many ways to honor Irish heritage during a wedding. Often, special Irish blessings are recited, and special Celtic music and dance are featured entertainment at the ceremony. As well, brides often carry a horseshoe for good luck. Many brides opt for a tiny silver or ceramic horseshoe which they can tuck into their gown. The horseshoe should point upwards for “good luck”. Along with Claddagh wedding rings , and lucky tokens and blessings, some brides and grooms of Irish descent enjoy adding a little flair to wedding invitations with the addition of Celtic script, ornate Shamrocks, and wild rose motifs. There are many ways to enjoy the rich, cultural tradition of the Irish during a wedding ceremony. Celtic knot work is an ancient symbol of the everlasting nature of existence. The intricate, never-ending lines of traditional Celtic knot work may also be referred to as interlace. Interlace is found on art treasures dating back to the sixth century, and it is a figurehead of the Insular Art Movement. In Pagan times, Druids worshipped nature and the Goddess. When Ireland began to convert to Christ, some symbols from Pagan times evolved into their current meanings. Interlace became a potent symbol of life-force and the melding of body and spirit. There is a spiritual meaning to the powerful beauty of detailed interlace. It is always a melding of the material and the ethereal. Many modern Claddagh ring designs feature intricate knot work, alongside the traditional Claddagh symbols of crowned heart and tiny hands. This joining of ancient and modern symbols produces pieces with even deeper meaning. You may find rings with Claddagh symbols, flanked by bands engraved with delicate knot work. These hybrid designs combine the best elements of Irish and Celtic design in a truly modern way. The most famous example of Celtic knot work is found in the Irish art treasure, the Book Of Kells, which rests at Trinity College in Dublin. In the Book of Kells, the Gospel is illustrated, and the border of each page are decorated with colorful, vibrant examples of interlace. The Book of Kells is a stunningly beautiful manuscript containing the Four Gospels. It is Ireland’s most precious medieval artifact, and is generally considered the finest surviving illuminated manuscript to have been produced in medieval Europe. Well worth a visit, she has many items on offer including custom designs. 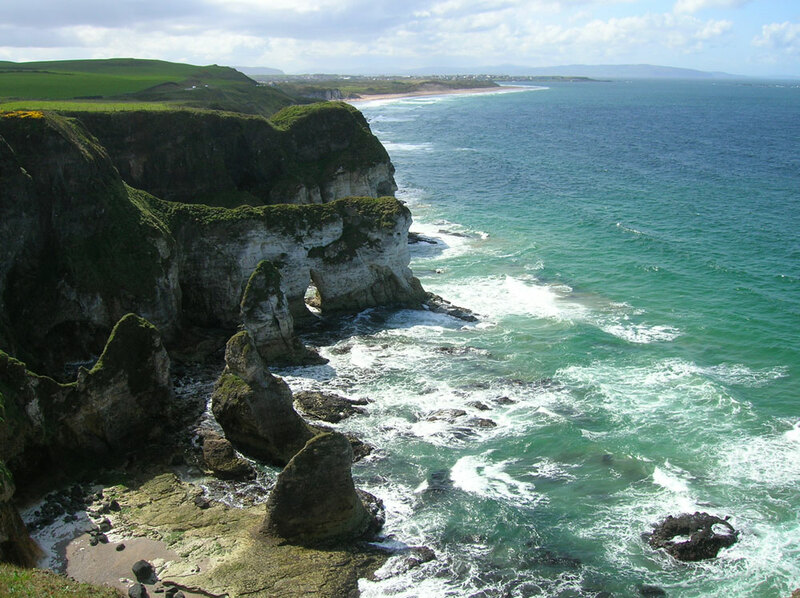 He was born in County Limerick, Ireland, where his parents, Garret Joyce (born 1796) and Elizabeth O’Dwyer, lived in the northern foothills of the Ballyhoura Mountains, west of Ballyorgan. Robert had three brothers: Michael, John and the writer Patrick Weston Joyce. The family claimed descent from one Seán Mór Seoighe (fl. 1680), a stonemason from Connemara, County Galway. Robert Joyce became a civil servant and succeeded his brother Patrick as principal of the Model School, Clonmel. He was a collector of Irish music and contributed many airs which were included in The Petrie Collection of the Ancient Music of Ireland, published in 1855. To finance his studies he contributed poems, stories and articles to a number of periodicals, including the Nationand the Harp. He produced a volume of poems, but remains most famous for contributions to the field of Irish music. “The Wind that Shakes the Barley“, “The Blacksmith of Limerick”, and “The Boys of Wexford” are some of his better-known works. Saying, “Brave United man, we’ll ne’er again be foes. Your shining eyes will be my prize – more dear then gold to me. He slapt it into Lord Mountjoy – a tyrant he laid low! And, if we failed to keep them, ’twas drink that brought us down. We’re ready for another fight, and love our country still! The Old Library and the Book of Kells Exhibition will close on Saturday 22 December 2012 at and will re-open again on Wednesday 2 January 2013. You are using my copyrighted artwork without my permission. PLEASE remove the dragonflies with the Celtic knots painting immediately. Good – I should certainly pronounce, impressed with your web site. I had no trouble navigating through all tabs and related information ended up being truly simple to do to access. I recently found what I hoped for before you know it in the least. Quite unusual. Is likely to appreciate it for those who add forums or something, site theme . a tones way for your client to communicate. Excellent task.